s that cover many GB (or TB!) of data. This amount of data cannot be stored on your iPhone. Which means a cloud solution. A typical cloud solution, like Dropbox or SkyDrive (oops OneDrive), comes to mind. But to use Yep or Leap with Dropbox you would have to put all your documents in your Dropbox. This can work for some people, but even then there are some rough spots when accessing your files using Dropbox or others – no content search, icons are tiny and generic, etc. For many or mostpeople though, the storage and other limitations (like perhaps you simply don’t want all your documents on your Google Drive) make cloud storage a non – starter. Spotdox solves that by allowing you to get back to your mac from wherever you are – on your phone, iPad, or any web browser. Full icons and full spotlight searching make accessing your files on the go easy. 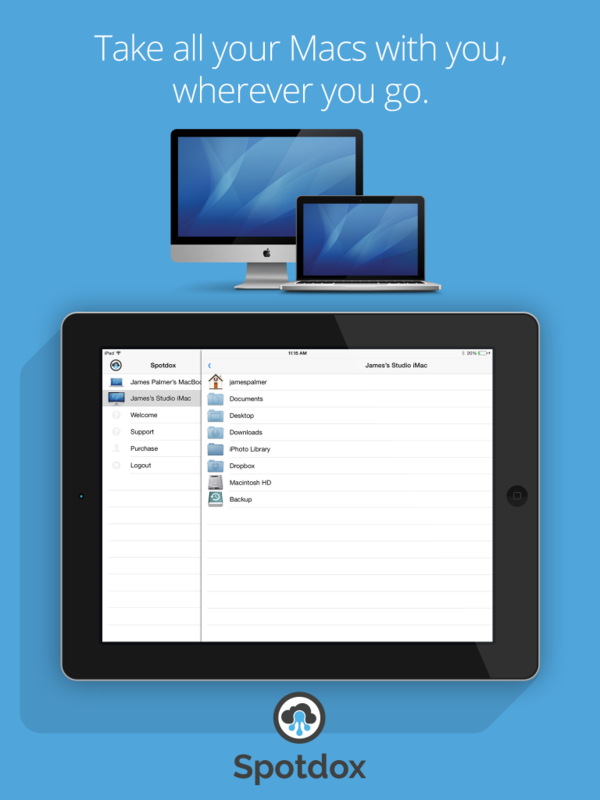 When you want to send a file to another person or edit / view a file on your iPad, Spotdox puts a copy of that file on your Dropbox account. With the plethora of tools that work with Dropbox already out there, you now have your office on your phone. Spotdox is developed by the same people that make Ironic Software products. ‘Back to your Mac’ is an Apple Trademark that refers to a service that allows you to get files from your own Mac only when you are on another Mac . Spotdox lets you access your Mac from any device – is that not what ‘Back to your Mac’ should be? Spotdox can function on your laptop while its in your hotel room, allowing you to reference your computer while you are out at a meeting or touring on your off day. Instead of moving your entire company’s data to the cloud, Spotdox allows you to use your existing LAN, permissions and security to allow employees to access documents on the go. A full ‘paper trail’ is provided for any documents that users share with other people, plus Spotdox can be configured to use two factor authentication or even your corporate single sign on service – any service that works with Dropbox will function with us. I would re-think this strategy. Most successful Mac apps have iOS counterparts these days. The above entry unhelpfully conglomerates Yep and Leap. Yep is a document manager, and Leap appears to be sold as a more general file manager. So yes, as mentioned above, cloud storage might be an issue – for Leap – but not for Yep. I have a huge document (PDF) library, and store it on iCloud drive – no problems there. Yep on iOS would be a huge help.